Angel Locsin "copied" Jennifer Lawrence's hairstyle, during last night's PMPC Star Awards 2013. And people loved it much that Angel is now being dubbed as the Jennifer Lawrence of the Philippines. Wearing a Francis Libiran gown at the PMPC Star Awards 2013 last night, Angel Locsin sported a "braided updo" hairstyle like that of Jennifer Lawrence during the premiere of "The Hunger Games" last year. The stunning Angel was styled by Pam Quinones, with her make-up beautifully done by Lala Flores, who posted the photo above on Instagram. And just like Jennifer Lawrence who won as Best Actress in the 2013 Oscar Awards, Angel Locsin also went home with the Best Actress trophy, her 2nd consecutive Best Actress win in the PMPC Star Awards for Movies. And guess who's the proudest of Angel Locsin's Best Actress win at PMPC Star Awards for Movies 2013? 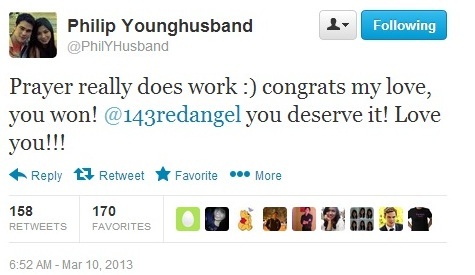 It's no less than his boyfriend Phil Younghusband who was among the first to post a congratulatory tweet to his "my love".